When I moved to Colorado from Virginia, I did so with one carload of my possessions. I left VA for a variety of reasons; the biggest one being that I couldn’t find a job. After my clothing store closed I was pretty destitute and I had a lot of trouble finding a job. I came across a roadblock like this from time to time. This one found me living out of my car on the streets of Virginia Beach, not even able to get a part-time job at 7-11. I knew it was time to pick-up and move on. The first office job I ever got happened about a month after I moved back into Denver. It was a domain name registrar in a small brick loft upstairs from Paris on the Platte, on 15th. The company was called DomainSite and we also ran a younger registrar called name.com out of that office. Soon after I was hired we moved into a much fancier office in Lowry, where I spent the next four years. The owner of these companies is a man named Bill Mushkin. Bill had lived a life much, much different than mine. It was hard for me to relate to him at times, at least partly because of those differences. I’m sure I took him by surprise from time to time too. Bill’s kindness, shrewd business sense and marked individuality is pretty amazing. I saw my boss weather strife both in business and personally. In good times, as well as in bad, I got to see Bill use his skill and authority to carve his business out of intentions as good as the values that they were born from.Throughout my tenure at this job I learned a lot more than the domain name racket. Bill’s uniqueness shines through everything he does. Anyone who knows him can bear testimony. He took me in and made me a part of his company, almost literally off of the street. Four years later I had knowledge of what I wanted to do and I was headed in the right direction. Here are a couple of things that I learned during that time. It’s hard to find your way by a single path. If you have the ability to create something large, you should already know how to manage the little things. It is also true that that in order to reach vast depths, you have to start in the shallows. Bill has been, among other things, a Wall Street trader, college professor and also founded a few wildly successful (and some starkly different) companies. When water comes out of the faucet it takes the shape of the container it falls into, filling each angle and curve. It can be a tiny drop, or a gigantic ocean; vapor, fluid & ice. Striving to be a successful, real-live, human company that serves an international customer base while maintaining a small staff with high morale… you have to adapt. If you can separate certainty from your path, when you overcome one obstacle easily, you will have already overcome every obstacle you will encounter. Specifically I mean matters of business and making your living. Businesses can be large or small, and industry continues to evolve with a life of its own. A freelancer who serves a handful of clients is not entirely different from an established company in a global marketplace. The difference comes in that the larger a company gets, the slower and less maneuverable it becomes. Individuals are able to move more quickly and are less predictable. Knowing one’s self, and one’s own strengths and limitations come only with practice. Every moment is a decisive one and a slack mind can equal certain defeat. Style is relative. There are old styles, new styles and different styles in every way of thought. The most efficient method of developing your own style is to clearly understand the styles of others. Morals, ideas and reasonable people will always conflict, no matter how you choose to act. Some will try to actively understand style, but still fall far from the mark. It is natural to misunderstand people, and small misunderstandings become large ones. If you are cognizant of your ethics, and you pay close attention to the intentions of others, you will avoid dangerous faux pas. No, I don’t mean go hiking. Nature is circumstances and it is chaos. It is incalculable; it has no beginning and no end. Nature is complete and unhindered freedom within the bounds of Natural Law. Only by knowing the nature of circumstance will you have the ability to develop strategy. There is rhythm in every situation. Once you have found this rhythm you will come to solutions without effort. 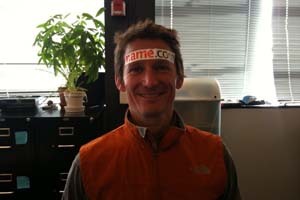 I’m hearing a lot more buzz about name.com around town lately, and I think it’s great. Name.com is sponsoring local nerd events and is keeping up an incredibly fun and friendly social media presence. I like seeing new people getting excited about my old company and I thought it was important to also know about the CEO, social leader and loving father who was responsible.